IOS Sailing Club is the friendly, family-orientated sailing club you've been looking for! 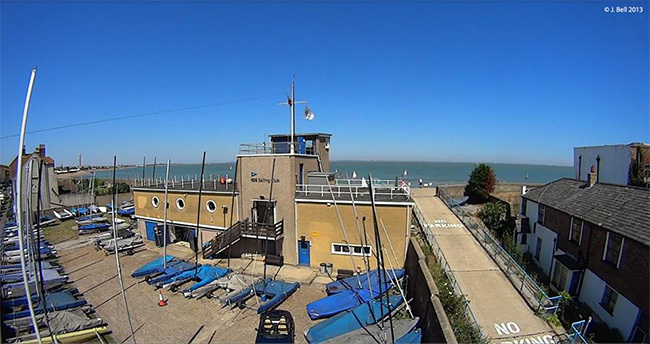 Located at Sheerness on the Isle Of Sheppey in Kent, with excellent sailing waters, facilities, road access, and easily accessible from much of the South East, the Club's primary objective is to encourage amateur dinghy & catamaran sailing with membership open to all. Annually, it hosts the famous IOS Round the Island Race — Europe's longest dinghy, cat & board race! As a Community Amateur Sports Club (CASC) anyone can join and new members assured a warm welcome. Please see the membership page for more. The Club is run by and for the benefit of members, with no full time staff, which keeps fees low. It's managed on a not-for-profit, self-help basis by volunteer committees elected annually and can trace its history back to 1896! It's affiliated to the RYA, the sport's governing body, and was one of the first sailing clubs in the South East to become an RYA Training Centre, able to offer training to members in both dinghies and powerboats. IOS Sailing Club is ideally situated, with access at all states of tide via wide concrete ramps and a gently shelving shingle beach to the best dinghy and catamaran sailing waters in the South East, if not the UK. By road it's easily accessible, even more so since the new Sheppey Crossing opened in 2006 which is just 30 minutes from the M25! The club itself is a half hour from Maidstone, less than an hour from London & much of the South East, and under 90 minutes from central London. A large free car park is just 3 minutes walk to the east of the clubhouse, opposite the Ship on Shore pub. The train station at Sheerness is one mile away, with regular trains to/from London via Sittingbourne (1 hour from Victoria). There's a large, modern, spacious, purpose-built clubhouse, originally described as probably the most modern in Europe, and still one of the largest and most unique clubhouses in the UK today. In 2011, the changing rooms were significantly improved with multiple new hot showers, new floors, new boilers, and a new disabled toilet/shower/changing room, plus a new hall floor all added thanks to a grant from the People's Millions / Big Lottery Fund. Space for dinghies in the primary compound (with launching at all tides) is unfortunately limited due to a historical oversight (and prioritised for the most active boats), but the club now also has a large satellite compound 1km to the east at Minster with its own slipway (usable 3 hours either side of high water), and hopes to further improve boat parking facilities in the future. Space for new or active members can usually always be made in the primary compound. 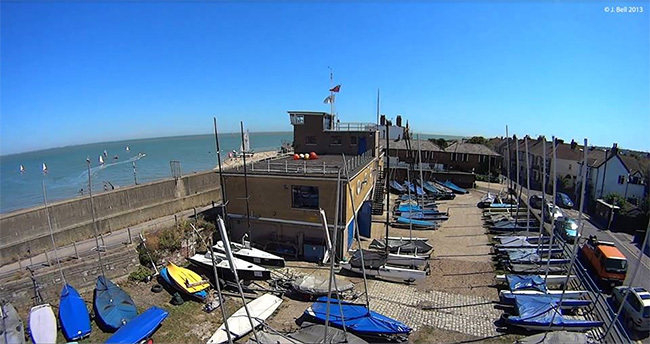 Clubhouse & primary sheltered boat park at Sheerness. Photo: J.Bell. Most Sundays, two or more races are run during the sailing season at 11.00 and 13.30, April to November, with the luxury of a short break for lunch in between. Racing's organised on handicap using the average lap time system which suits all boat types, with races of 45 minutes duration for the leading boat and everyone else finished after that. The flagship event is the annual IOS Round the Island Race, a 40 mile sailing marathon comprising a full clockwise circumnavigation of the island, run since 1959! Most years a popular cruise & camping weekend to Harty Ferry is held, one of Kent's top beauty spots. Cruises are also organised to Southend and other locations depending on demand. 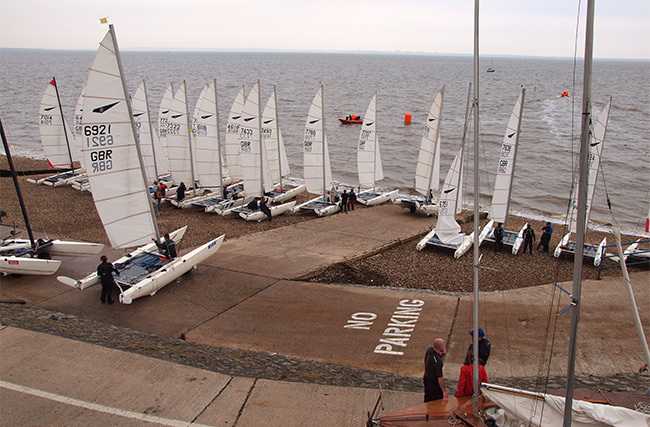 All are welcomed whether their interest lies in racing, cruising, leisure sailing or just being part of a sailing club. A number of social events are held during the year, usually around key events in the sailing calendar. Due to its not widely recognised location, for a long time the Club has, surprisingly - given its many considerable natural advantages - been overlooked. This can probably be attributed to misplaced assumptions: Sheerness and Isle Of Sheppey sound like they could be located in Scotland rather than north Kent, and/or difficult to get to - neither of which could be further from the truth! ... and not for the first time! Prior to years of severe disruption caused by the construction of a heavily engineered sea wall around Sheerness - built in the late 1970s to protect the town from increased water levels downstream in the event of the Thames Barrier being raised - the two clubs at Sheerness could boast a combined membership of more than 800, making it for a brief period one of the most popular places to sail in the country, with CYC's world famous International Catamaran Week regularly attracting top sailors from around the globe! 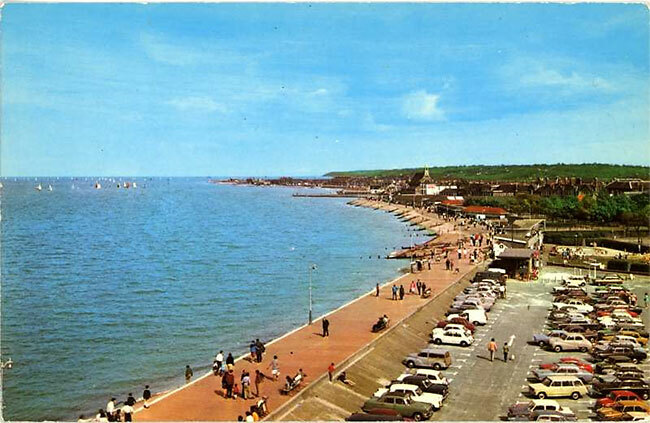 Sheerness 1960s, prior to the new wall, with perhaps 60 - 100 boats on the water. Photographer: unknown. Come and join a club that has exceptional sailing waters, easy road access, great facilities and excellent long-term prospects, whilst you still can! You may be surprised at how well we compare with some of the biggest, and many better known venues! The author can say this with some confidence having sailed at a wide range of venues sea & inland, big & small, professional & amateur including: Salcombe, Grafham, Bewl, Medway, Thorpe Bay, Whitstable, Wilsonian, Redcar, South Cerney, Blue Circle, Silver Wing, Sandwich Bay, Downs (Deal), Dover, Hythe & Saltwood and Redoubt. IOS is completely unique in managing to combine the feel of sea & inland sailing in one venue. 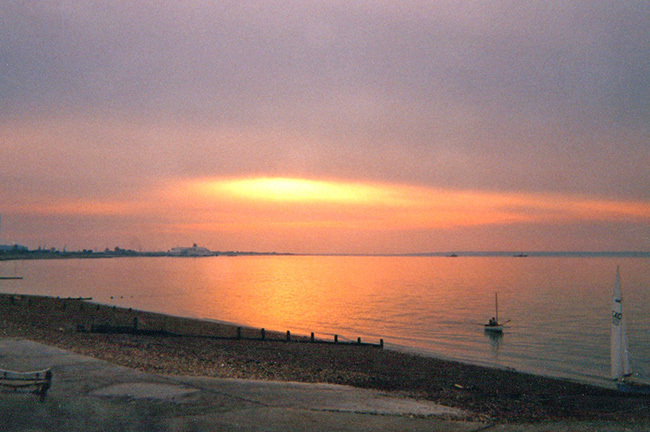 With Southend only 5 miles away on the opposite side, and the Isle of Grain providing shelter to the west, the main sailing area looks & feels like one huge reservoir, but with the open sea to the east, which makes it much less intimidating than most coastal venues. Launching ramps and beach (Dart 18 Open).